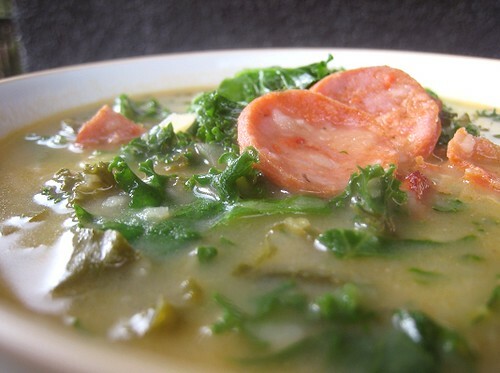 I don't remember exactly how, why, where or when I first discovered caldo verde, but it has been one of my favorites soups since then. It is so simple to make and so satisfying. 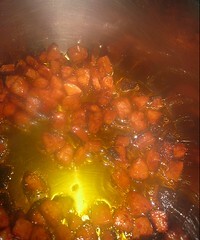 I start by cooking some chorizo in some olive oil. Look at how the rendered fat colors the oil! I set the cooked chorizo aside, then add diced onion. I let the onions cook until softened. The diced potatoes go in next, then water to cover. 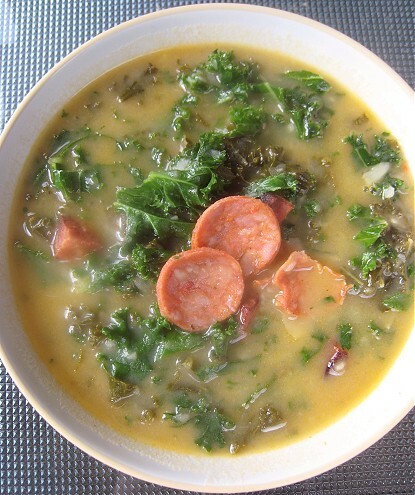 When the potatoes are tender, I process the soup (using a hand blender) to my desired consistency, return the cooked chorizo, then add the kale. I simply let the kale cook and the flavors meld together. I actually prefer some kale to be really cooked down, and some "fresher". So, I simply divide my kale, letting half cook for a longer time, and the other half for only about 5 minutes or so. I also find that I prefer less chorizo pieces while I'm eating the soup (blasphemy, I know! ), but then, I'm afraid there won't be enough chorizo flavor in the soup if I cut back. Oh, the problems I have in life! Since we tend to have a lot of chorizo pieces left in the soup when the liquid has long gone, a simple reusing of the chorizo solves all problems. Add them to eggs! Make fried rice! How can anything not be enhanced by the addition of chorizo? I didn't mind eating this for 4 straight meals in a row. I didn't mind at all. In your stockpot, heat a scant amount of olive oil over medium heat. Add chorizo and brown. Remove chorizo and set aside. Remove excess fat, if desired, but leave some in the pot. 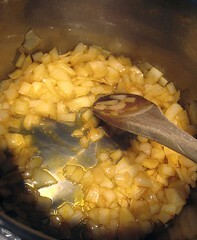 Heat the rendered fat in the pot, and add onions, cooking until softened. 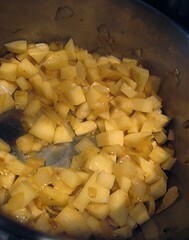 Add diced potatoes and stir for about 30 seconds. Add water to cover. Bring to a boil, cover, and let simmer until potatoes are tender. When potatoes are tender, process the soup in a blender, or use a hand blender, until desired consistency. The soup shouldn't be too thick. Thin with water if necessary. Add back the cooked chorizo and let the soup simmer for about 10 minutes. 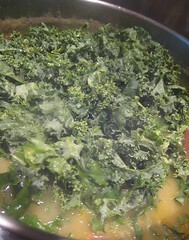 Stir in kale leaves and let cook until your desired level of doneness. Season to taste. Serve. in the winter we eat this all the time and sometimes even use--gasp--soy chorizo. My sister married into a Portuguese family and are going to the Azores Island in two weeks. I'm going to make this soup as a send off dinner. Thanks for the post. This is a huge favorite of ours as well & we make it often in the winter. I love the chunky, rich texture of your soup. I love chick peas and potatoes so this is such a nice combi. this looks like perfect comfort food! Thanks for the recipe. I am one of those wierd people that can eat kale on it's own and call it a great meal. Add chick peas and sausage.....well, that has to be a fabulous meal. No wonder you ate this three days in a row and enjoyed it. Haha... You guys live on the edge! That would require the *advanced* planning of making pork stock! We eat all over the seasons. Although, weather is weird as it is actually raining and cool in Vancouver right now. I second Manggy's comment about using smoked Spanish paprika in lieu of chorizo. I have used it in place of meat in soups many times with success. Ah, we'll have to try that, then! So we wouldn't have all those extra bits of chorizo. I came across this recipe about a week ago when I was on a chorizo kick. I am on the northern plains and haven't been able to come across the chorizo that I think is called here, so I used andouille instead (i love this after years spent in Louisiana and Mississippi.) The only changes I did here were I used andouille instead of the chorizo, and I used chicken broth in place of most of the water. I was very pleased with how relatively easy this was to make, how quickly it came together, and the use of kale. I've never used kale before! I will definitely be making this again. Thank you for such a good recipe. Thanks so much for trying it! And thanks for the feedback! 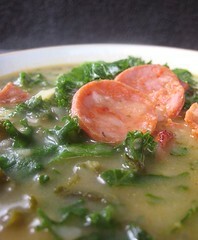 =) I think caldo verde was also the first instance I had tried kale.